This is the radio ad from 1939 that started it all. 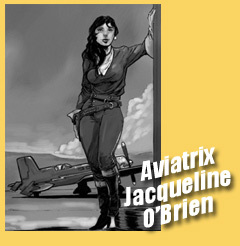 Sponsored by The Imperial Meat Company, makers of the King of hotdogs, and the August and Lane publishing house, who created the idea for the marketing that drove the creation of Captain Spectre. 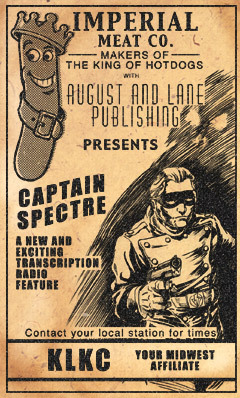 Coming Soon... the complete story of the creation of the midwest's own pulp hero - Captain Spectre. 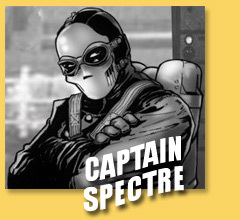 Captain Spectre, once known as only the name of a popular radio drama character, is now known to be a real person. His origin remains a mystery, for now. 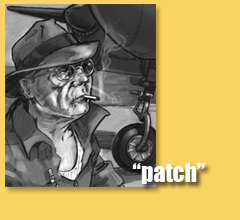 "Patch", who's real name is somewhat vague, is the designer, builder, and mechanic of the Legion. 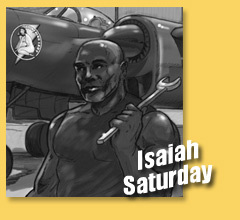 Isaiah Saturday, metallurgist, and adventurer. 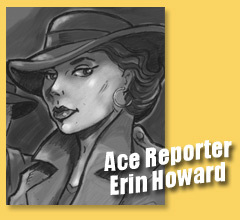 Ace Reporter, Erin Howard was the first reporter to break the story of the 'real' Captain Spectre.